Air freight offers you the flexibility and speed to reach the markets of the world in time. With our global network and the service of first class carriers with contracted rates your shipments will run smoothly. 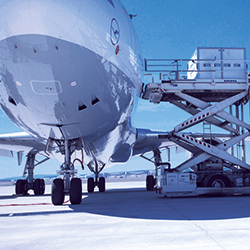 Take advantage of our global total-coverage logistic network. The most efficient handling of transport tasks is guaranteed by using the best carriers. Interfracht is a certified IATA Agent and has been nominated as one of Lufthansa´s strategic business partners. We are founder member of IGLU – a nationwide airfreight cooperation with more than 23.000 tons of airfreight volume. Our know-how of over 40 years of market presence is your benefit. With offices that are perfectly located at various German airports. If you prefer consolidated, individual or even a full charter, we will make the service suits your shipments.